You find the price of a restored one a little too rich for your blood? 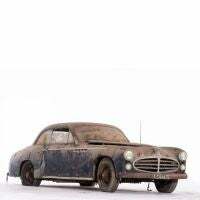 Here's one from the recent barn find, being auctioned in Paris on the 6th of February. No reserve, estimated to fetch €20,000 to €25,000. Go on, you know you want to. Catch? Given the publicity, it'll go for a lot more than that. Oh, and the purchase price is just the start of a long and expensive process.